Sing it with us: What lives in the rainforest, under a tree? Spongiforma squarepantsii, a new species of mushroom almost as strange as its cartoon namesake. Its discovery in the forests of Borneo, says San Francisco State University researcher Dennis Desjardin, suggests that even some of the most charismatic characters in the fungal kingdom are yet to be identified. Shaped like a sea sponge, S. squarepantsii was found in 2010 in the Lambir Hills in Sarawak, Malaysia. It is bright orangealthough it can turn purple when sprinkled with a strong chemical baseand smells "vaguely fruity or strongly musty," according to Desjardin and colleagues' description published in the journal Mycologia. 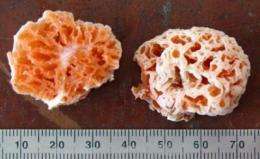 The new species is only one of two species in the Spongiforma genus. The other species is found in central Thailand, and differs in color and odor. But close examination of the fungi and genetic analysis revealed that the two were relatives living thousands of miles apart. "We expect that it has a wider range than these two areas," said Desjardin, a professor in ecology and evolution in the SFSU Biology Department. "But perhaps we haven't seen it in more places because we haven't collected it yet in some of the underexplored forests of the region." Desjardin said Spongiforma are related to a group of mushrooms that includes the tasty porcini. But the genus sports an unusual look that is far from the expected cap and stem style. "It's just like a sponge with these big hollow holes," he explained. "When it's wet and moist and fresh, you can wring water out of it and it will spring back to its original size. Most mushrooms don't do that." Spongiforma's ancestors had a cap and stem, but these characters have been lost over timea common occurrence in fungi, Desjardin noted. The cap and stem design is an elegant evolutionary solution to a fungal problem. The stem lifts the fungus' reproductive spores off the ground so that they can be dispersed more easily by wind and passing animals, while the cap protects the spores from drying out in their lofty but exposed position. In its humid home, Spongiforma has taken a different approach to keeping its spores wet. "It's become gelatinous or rubbery," Desjardin said. "Its adaptation is to revive very quickly if it dries out, by absorbing very small amounts of moisture from the air." S. squarepantsii now has another claim to fame: It joins the five percent of species in the vast and diverse Kingdom Fungi that have been formally named. Researchers estimate that there may be anywhere from 1.5 to 3 million fungal species. "Most of these are very cryptic, molds and little things, most of them are not mushrooms," Desjardin said. But even mushroomswhich are sort of like the big game of the fungal worldare mostly unknown. "We go to underexplored forests around the world, and we spend months at a time collecting all the mushrooms and focusing on various groups," Desjardin said. "And when we do that type of work, on average, anywhere from 25 percent to 30 percent of the species are new to science." Desjardin and his colleague Don Hemmes of the University of Hawaii at Hilo will describe five new white-spored species of mushrooms from the native mountain forests of Hawaii in an upcoming issue of Mycologia. The Hawaiian species are among the diverse set of organisms found on the islands and nowhere else in the world. Desjardin and his colleagues are racing to discover and study the islands' fungi before native forests succumb to agriculture and grazing. "We don't know what's there, and that keeps us from truly understanding how these habitats function," Desjardin said. "But we think that all this diversity is necessary to make the forests work the way they're supposed to work." More information: "Spongiforma squarepantsii, a new species of gasteroid bolete from Borneo," was published online on May 10, 2011 in Mycologia.